Home » Italian Lace History. Reference List of Italian Laces. Italian Lace History. With Reference List of Italian Laces. Reticella, Punto Tagliato a Fogliami. NO other article of attire has been so hemmed and hedged about with restrictions, orders, edicts, and laws as this, the most becoming of all the frivolities of woman’s attire. Writing in the twentieth century, when the utilitarian and entirely ungraceful habits worn by men have superseded those rich and graceful costumes of a century or two ago, one is led perforce to grant to women the sole use of this most elegant ornament. This is, however, only a matter of evolution. At first the richest laces were worn by men, and there was not a single article of attire, from hat to shoes, which was not decorated with it in one form or another. In fact, as a sprightly writer in the “Quarterly Review” for 1852 puts it,— “we cannot point to one single excess or caprice of dress which has appeared on the beautiful person of woman, that has not had its counterpart, as bad or worse, upon the ugly body of man. We have had the same effeminate stuffs—the same fine laces—the same rich furs—the same costly jewels. We have had as much gold and embroidery, and more tinsel and trumpery. We have worn long hair, and large sleeves, and tight waists and full petticoats. We have sported stays and stomachers, muffs, earrings and love-locks. We have rouged and patched and padded and laced. If they have lined their petticoats with whalebone, we have stuffed our trunk-hose with bran. If they have wreathed lace ruffs around their lovely throats, we have tied them about our clumsy legs. 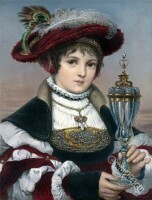 Portrait de la marquise Lucrezia Ricasoli Zanchini, née Rinuccini by Luigi Sabatelli. Gimp lace, probably made at Ragusa. 16th century. The desire for the enrichment of the plain edges of garments manifested itself first in embroideries of silk in various colours, mixed, if possible, with gold or silver threads. This gave way to “cut-work,” as it was called, where the material on which the embroidery was wrought was cut away, leaving open-work spaces. So perishable is this costly product, lace, that many of the earliest specimens have ceased to exist by the mere falling away of the materials of which they were composed, so that a great source of information as to the periods when certain laces were used, and how, is the pictures of the times. Cut-work to embellish sleeves and the necks of garments was shown as early as 1460. The earliest cut-work, which is called Punto Tagliato, had for its foundation coarse woven linen. Elaborate patterns were buttonholed on this, and the linen cut away, so that it became more and more elaborate and ornate. The latest stage of this cut-work was made, not on coarse linen, but on fine lawn, known as “Quintain” from the town in Brittany where it was made. Over the lawn, which was fastened to a light wooden frame, were stretched threads which crossed each other back and forth, and which were sewed to the lawn with buttonholing, such parts of the lawn as were unnecessary being cut away. Little by little new stitches were tried, different designs were introduced, and the first work which bore any resemblance to lace and eventually grew into its finer forms was called “Drawn Work,” or Punto Tirato, some of it being of great delicacy and beauty. Punto a Reticella, or “Greek lace,” as it was commonly called, was made in both insertions and edgings. It was really the first needle point, as well as the first lace; since both cut- and drawn-work, which had preceded it, were more lace-like material than real lace. Greek Points or Reticellas were made in abundance from 1480 to 1625. Not only did they decorate vestments and altar-cloths, but whole shrouds were made of them as well. The earliest of these points—made in stiff geometric designs, such as were used in Gothic architecture—were at first threads buttonholed over, the foundation being cut away, or threads being drawn out, and little loops called “picots” or “purls” being set along at intervals. Later the varieties of pattern became greatly extended, wheels were introduced, and triangles with inside ornaments of great beauty. Designs alternated in the points, giving it great variety, and toward the end of its career the patterns lost their geometric tendency, and, as far as the limited nature of the work would allow, followed the style of design popular in other laces of the Renaissance. In some of the richest of the old Greek Points, to add to their beauty, silk threads of different colours were introduced as well as gold and silver. The best means of studying this lace is in the splendid portraits of the period, when artists delighted to linger over every loop and purl, and rendered the lace with a fidelity which betrayed their appreciation of it. Point d`Alençon. 17th century. 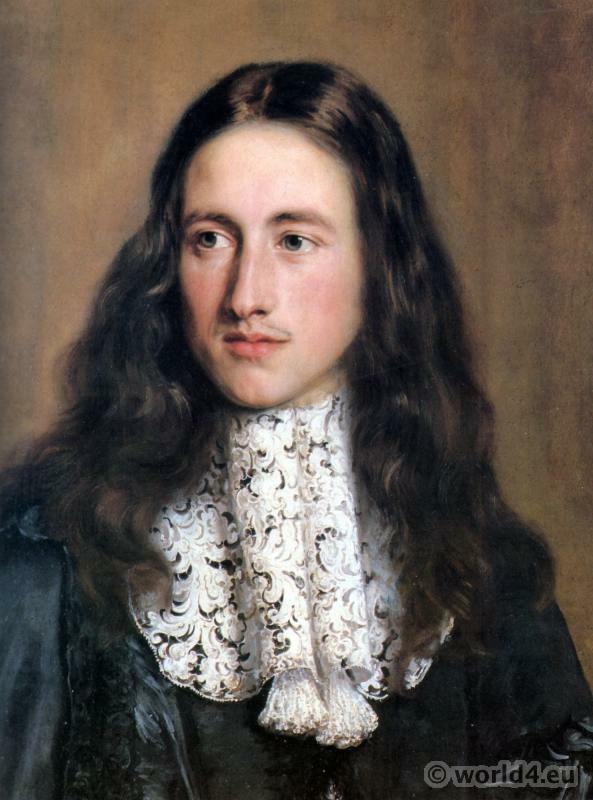 Style of Louis XIV. Needle point. Although it was freely worn in France, Germany, England, Spain, and Flanders, little of it was made in any of these countries. In its home, Greece, and in the Ionian Isles and Italy, enough was made to supply what was needed in all these other countries. As finer laces were made, the Reticellas fell into disuse, and their production declined. 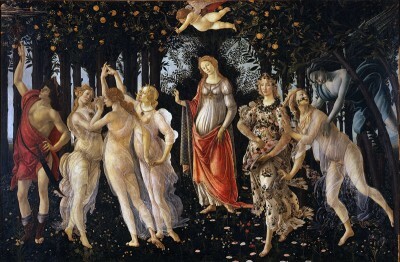 With each succeeding year, under the skilful fingers and in the artistic atmosphere of Venice, all work became more and more beautiful, and the next step forward was Punto in Aria,—literally “point in air,” showing the departure from cut-work, or drawn-work, in having no cloth or thread foundation upon which the pattern was worked. 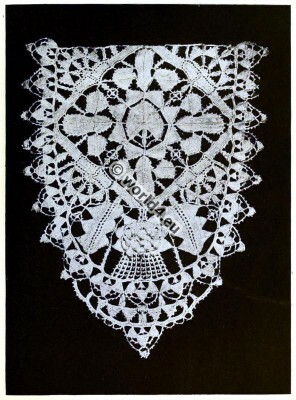 It was in reality what we call “lace,” worked on a parchment pattern upon which the design was clearly drawn, and enriched with many very beautiful stitches, the various parts of the design being connected with ” brides,” or bars, made of buttonholing and ornamented with loops of thread and sometimes with tiny wheels. 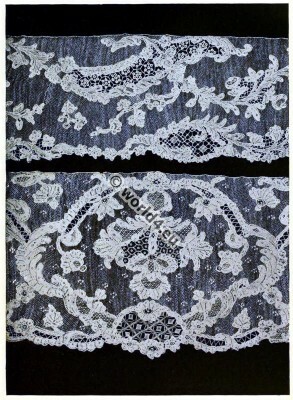 It was not difficult to trace how, little by little, this lace became the celebrated Punto Tagliato a Fogliami, which was made in the same manner as Punto in Aria, but made richer and heavier by the use of heavy threads in some portions of the pattern, so that the outlines and edges were much raised. This thread or fine cord used to outline the pattern in needle-point laces is called cordonnet. Sometimes the outlining cord is still further enriched by loops of thread, purls, or other ornaments which were then known as “Crowns,” or Couronnes, when they came on the edge of the lace, and as Fleurs Volantes when they came in the body of the lace. Eleanor of Toledo, wife of Cosimo II, Duke of Florence, died 1562. Showing chemisette of drawn-work very beautiful in design, and net of knotted gold threads. 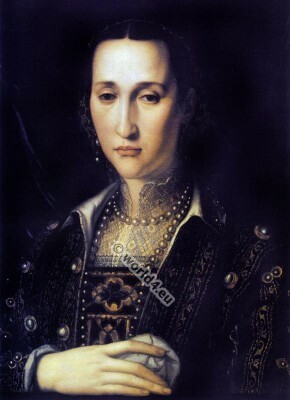 Portrait by Bronzino. The variety of complicated stitches used in the flat parts of the lace are without number and of exquisite beauty. This rich point is the famous lace known as the Gros Point de Venise, or “Venetian Rose Point,” which was the most sought-after and celebrated lace of the seventeenth century. No cavalier was fully dressed without the use of some of it in his costume, and no grande dame hesitated to adorn herself with it for any ceremonial occasion. The pictures of the times show the use of this lace when it was at its greatest beauty, and when the artist prided himself upon the fidelity with which he copied it. Besides these four there were two other varieties of lace made in Italy during the fifteenth century,— one a coarse knotted lace, Punto a Groppo, made of cords similar to what is known as Macramé. Then there was the darned netting called Lacis, in which patterns were stitched upon a lace ground already prepared. This was not used for clothing, but for domestic purpose, bed-linen, curtains, etc. There are so many technical terms used m lace, and their meanings and the ways in which they are applied have so changed with the years, that it is necessary to give several of them before proceeding further. For instance, we now apply the term Guipure to all laces having large, showy patterns with coarse grounds, requiring no brides to hold the pattern together. Originally Guipure referred to lace made of gold and silver cords, and no doubt the white and gold lace worn by Berengaria at the coronation of Richard III was this same Guipure. Among other items of expense for the coronation ceremony it is stated that the Queen wore a mantle of cloth of gold with trimmings of lace of white and gold. This lace was extremely costly, and could be worn only on the garments of the rich, and was subjected to many sumptuary decrees. It was ultimately made in thread, which material showed itself admirably adapted for making an ornamental trimming of great beauty. Early in the seventeenth century when lace was in such great demand, a finer quality was made with grounds, or network mesh into which the pattern was worked. Such laces are called à réseau. 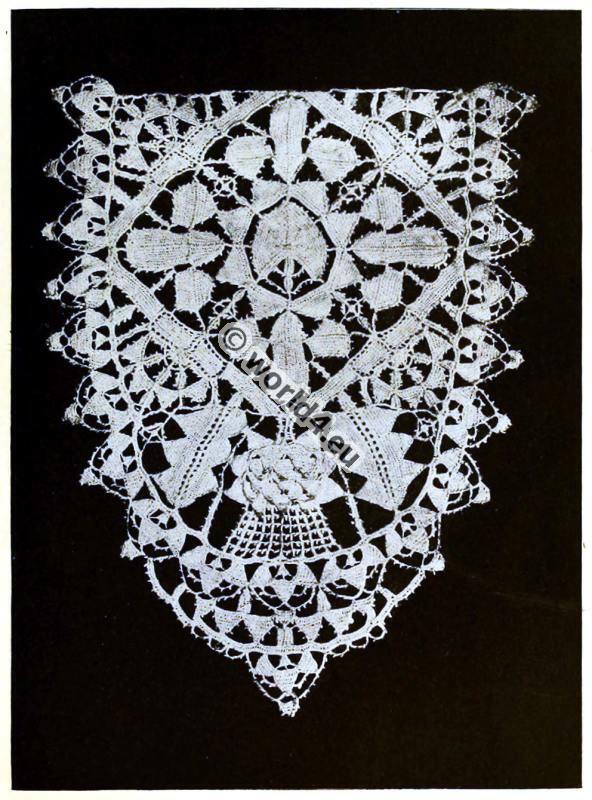 Guipure lace was made either with bobbins or with the needle, sometimes with both, as when the large flowing pattern was first made on a pillow with bobbins, and the clusters of flowers, leaves, and ornaments were filled in with stitches worked with a needle. The English term for this old Guipure was “Parchment lace,” and as such it is frequently noted in inventories. This same name was made to cover a trimming made of twisted silk cords, — what in modern times is known as passementerie. Punto in aria. Italian needle point. Early 16th century. The old silver and gold Guipure looked much like modern passementerie from the coarse character of the cords which composed it. It was made all over Italy: in Milan, Florence, Genoa, Lucca, and Venice. 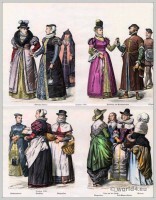 At this time, the sixteenth century, Italy was the headquarters for all the rich and sumptuous articles of dress which decked the persons of both men and women. Silks, velvets, and damask were made in her cities, enriched with threads of silver and gold, and bearing that “stand alone” quality of which we have heard our grandmothers speak. The Italian cities were rich and prosperous. Love of beauty, ever a factor in the Italian heart, sought expression in paint, in stone, in stately architecture, in dress, and in small refinements and ornaments. Artists did not consider it beneath their abilities to design patterns of jewellery and linger lovingly on the setting of a gem. Indeed, several artists whose names added lustre to Italy’s greatness began to work as goldsmiths’ apprentices. Such an one was Domenico Ghirlandaio (1449-1494 ; Domenico di Tommaso di Corradi Doffo Bigordi was a Florentine painter of the Renaissance. ), the “garland-maker,” who wrought, in gold, flowers as fine and delicate as a hair. 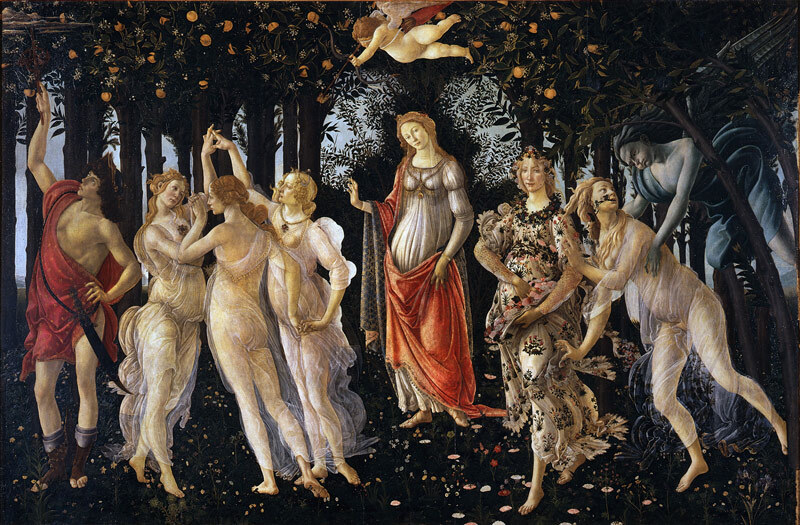 Alessandro Botticelli has clothed his figures dancing on the hillside in “Spring” in gauzes fine as lace and almost as beautiful. The rich and magnificent viewed with alarm the encroachments upon their prerogatives. The usurpation, by the prosperous middle classes, of those things which those born in the purple considered their own prerogatives, gave rise to sumptuary laws, which sought to regulate the expenditure of those who wished to lavish too much money upon splendid gauds. Perhaps the earliest sumptuary law framed in regard to women’s dress was that passed in Rome, 215 B. C. and called the Oppian Law. This provided that no woman should possess more than half an ounce of gold, wear a dress of different colours, or ride in a vehicle in the city, nor within a mile of it except on occasions of public religious ceremonies. This order was repealed twenty years later. In more modern times the first important sumptuary laws in Italy were those of Frederick II (1194-1250). The Great Council forbade the use of any trimming which cost more than ten lire in all. In the next century (1348) colours were a matter against which laws were framed, and neither dark green nor black gowns were allowed to be worn in the morning; while in 1330 edicts had been passed allowing only embroidered figures on dresses, not painted ones. By 1414, however, the manufacture of gold lace had so far progressed that the horses in a state procession at Venice had housings of gold lace. Of course this was of a less rich character than that used on clothes. Prohibitions of gold embroidered and trimmed garments were passed in 1481, but, notwithstanding this, the manufacture and wearing of gold lace continued. 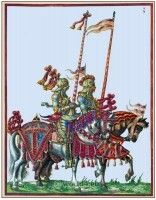 About 1500, Ercole I d’Este (1431-1505), Duke of Ferrara, created the Order of the Golden Spur (Ordo Equestri Militiae Auratae, official name is Ordine dello Speron d’Oro, also Ordine della Milizia aurata, is the second highest medal for services to the Roman Catholic Church. It is awarded directly by the Pope. ), and to the gift of the spur was added a sword, a mantle trimmed with gold lace, and a grant of money. With these emoluments a quantity of service was expected. 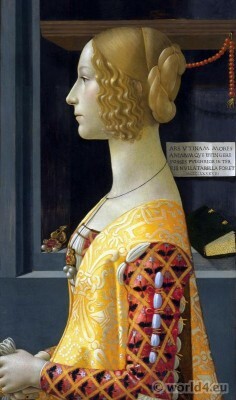 About ten years before this, on January 26, 1491, at the wedding festivities at Milan held in honour of the marriage of Lodovico Sforza and Beatrice d’Este, the fêtes were a succession of most gorgeous pageants, in which men and women were robed and jewelled with a richness unparalleled even in the days of the Renaissance. In a tournament which was one of the crowning festivities of the week the combatants entered the lists in companies, clad in fancy costumes, and bearing the devices which were the fashion of the day. The Mantuans, a troop of twenty horsemen, were clad in green velvet and gold lace, and bore in their hands golden lances and olive boughs. The old burgomasters of Florence made a firm stand against indulgences in dress and ornament. They aimed their strictures against the frivolities of women’s attire, though the fop of the day was as much bedecked in his way as the belle was in hers. Dante aims some of his scarcasms at the rich chains and crosses worn about the neck and over the doublet, and the girdle of gold or silver, studded with stones and fantastically wrought, with which the good citizen begirt himself instead of with leather, as he did in earlier days. For the guidance of the feminine part of the Republic of Florence were these laws framed at the time when the only lace so far known was that twisted of strands of gold and silver. 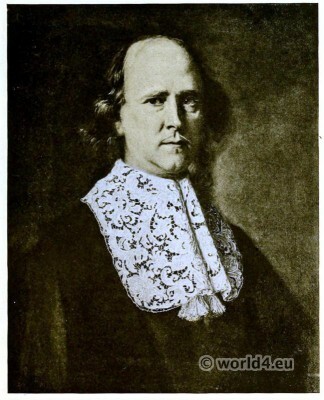 “No woman of any condition whatever may dare or presume in any way in the city, suburbs, or district of Florence to wear pearls, mother-of-pearl, or precious stones, on the head or shoulders, or on any other part of the person, or on any dress which may be worn upon the person. Item. She may not dare or presume to wear any brocade of gold or silver, or stuff gilt or silvered, embroidered or trimmed with ribbons, neither on her shoulders nor on her head, nor on any garment as described above. Item. She may not dare or presume to wear more than one pound of silver in the shape of garlands and buttons, or in any other way, on the head or shoulders, or otherwise as has been said above; except that besides the said pound of silver she may wear a silver belt of fifteen ounces’ weight. Item. She may not dare or presume to wear any slashings, in any robe or dress, neither at the bosom nor at the sleeves, nor to cuffs or collars, larger than the seventh of a yard according to the measure of the yard of the wool-workers, and these slashings shall not be lined with skins either of wild or tame beasts, or with silk, but only with woolen or linen, nor must they be trimmed with fringe either of silk, silver, or gold, or gilt or silvered. Item. She must not wear on her fingers more than three rings in all, and the said rings can have no more than one pearl or precious stone in each, and the said rings must not exceed the weight of silver allowed above. Item. No person in the city, suburbs, or district of Florence shall permit himself or presume to give in any way to any woman any kind of collar or buckle, or garland, or brooch of pearls, or of gold, of silver, or of any other precious stone or similar thing, by whatever name it may be called. It can readily be seen how heavily such laws as this would fall upon the workers in gold and silver thread. Some of them left Italy and settled in other countries, where they pursued their trade and instilled a demand for these luxuries. Others remained at home and escaped the edict by making the lace of flax thread, coarse at first, heavy and raised, and growing finer and finer with the demand till it resulted in the exquisitely fine flat Point which became the pride of Venice and the desire of all the world. Both sexes made use of lace in their personal attire, and even before there was any distinct record of its export the fame of Venetian lace had spread far. But while Venetian laces were in great demand both at home and abroad, and the revenues brought in by them were large, they still met with opposition in their own country. Officers of the Republic issued several ordinances against the wearing of Punto in Aria in towns under pain of a fine of 200 ducats. The earliest-dated pattern-book is of 1527, and contains patterns only. It was published at Cologne by O. Foelix. There are, however, undated pattern-books which have come down from monasteries, and they show patterns for edgings of Reticella or drawn-work as well as insertions, and so extremely beautiful that they vie in delicacy with the needle point, or Punto in Aria. In 1537 Zoppino published his book of patterns, “ancient and modern.” The use of lace became more and more extended, and the patterns numerous. While the general character remained the same, there were certain stitches guarded as secrets by the convents where they were invented. As early as 1550 Matio Pagani brought out: “A good example of the laudable desire of noble-minded ladies to learn the art of making Guipure laces, with 31 engravings. 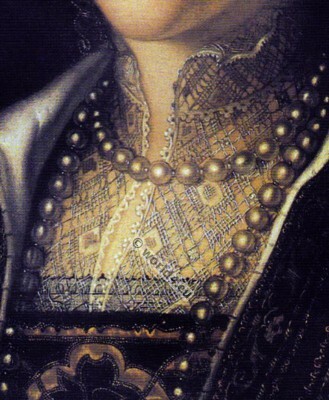 In 1546 Andreoni Vavassore (called Guadagnini) first published his – “New Universal work, entitled the Crown of Embroideries, in which worthy ladies and maidens will find various patterns for making collars of shifts, covers of cushions, silk coifs of many kinds, and a large number of works for embroiderers. The idea of attracting the mother’s attention by providing occupation for her daughters seems first to have occurred to John Ostaus. In 1567 he produced: “A most delightful way of occupying your daughters with work, such as the chaste Roman Lucretia gave her maidens, and upon which they were found employed with her by Tarquin and her husband Collatinus, as described in the first book of the Decades of Livy. The most famous lace book in both Venice and France was that published by Federico Vinciolo at Paris in 1587. It went through many editions, and was in two volumes, the first devoted entirely to cut-work, the beautiful patterns for which are shown in white on a black ground, and the second volume showing lacis, or darned work, most of the designs being in squares, with counted stitches like modern worsted work. As early as 1596 patterns were published by Giacomo Franco for lace made with bobbins, suitable for sheets and handkerchiefs. There were many other books showing designs for cut-work, drawn-work, and the Gros-point, which was worked on parchment. The cut-work was made so beautiful that it became greatly in demand, and was introduced into France, where it became very popular. As the making of other lace trimmings arrived at a greater state of perfection, the use of cut-work declined, but during the whole of the fifteenth and sixteenth centuries it remained in fashion. When no longer popular for dress and outer garments it was used as borders for linen underwear and household linen. Of course the high Church dignitaries had first choice of the exquisite convent laces. One set of nuns might begin the magnificent altar laces or those for the ecclesiastical robes, and die before their completion. But there were always plenty of willing and industrious fingers to take the work right up and carry it on. Nor were these laces confined to personal decoration for Cardinal or Bishop. In the inventory of Giovanni Battista Valier, Bishop of Cividale di Bellemo, written in 1598, mention is made of five pieces of bed-linen of needlework Point, “ancient works.” There were pillow-cases of the same lace, besides napkins of similar work equally old. In the sumptuary laws of Venice in the years 1616, 1633, and 1634, the use of this lace was proscribed. Yet fashion circumvented these laws and retained the use of the lace even though there was a penalty of 200 ducats for each offence. 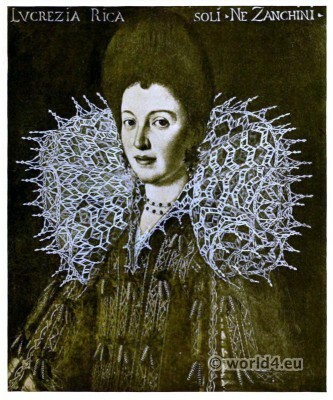 Reticella was very ornamentally used, early in the fifteenth century, by Venetian and Florentine ladies, to veil their necks, when the fashion of the day called for their gowns to be open. The perfection at which this lace arrived is shown in some of the accompanying illustrations, and it seems a pity that change of fashion caused its decline. Punto Tagliato a Fogliami, or flowered lace, acquired a greater renown than any other made at Venice, on account of the beauty of its design. Everybody, whether of the Church or the world, strove to own some of it, and men as well as women hoarded it for love of its beauty as well as for the pleasure of wearing it. The Doge Francesco Morosini (1618-1694) had wonderful laces of this make, which are still jealously guarded by his family. Some of them are shown in his portraits, and portraits of other Venetian noblemen who lived from the seventeenth to the first half of the eighteenth century depict how highly this lace was esteemed. The festivals and all ceremonial occasions were opportunities seized by the beauty-loving Italians for the display of their richest finery. The entrance of the Doge Luigi Mocenigo into office, April 18, 1763, is described by an anonymous contemporary. The share of the Dogaressa in the festivities seems to have been of equal importance. She went to the palace by water, accompanied by her mother and many other female relatives. Seated upon a dais in the great hall, she received the congratulations of the members of the Electoral College and of others present. The festivities lasted three days, and on one evening there was a ball, during which the Dogaressa danced a minuet. Her outer robe was cloth of gold, like that of the Doge. The under-petticoat showed in front where the robe flowed aside, and was smothered in floral sprays of gold lace. On her head she wore a lace veil so disposed as to look like a berretta, though lace lappets fell from it on either side of the face. The costumes of the ladies present showed that the use of gold lace and jewellery was not diminishing. The appearance of both men and women during the Renaissance in Italy was more beautiful and polished than among any other nation in Europe. Their dwellings surpassed in comfort and luxury any of the habitations of the noblemen of northern Europe. The style of dress varied continually, and nowhere did it assume such importance. Even while the Church was gathering in the richest work, beautiful graduated fronts were being made for the great Neapolitan ladies, showing the demand there was for these sumptuous trimmings. The earliest Italian inventory which gives the names of the laces in vogue at the end of the fifteenth century is that of the rich and powerful Sforza family, dated April, 1493. A division of family property took place, in the records of which not only the jewels are mentioned, but rich stuffs, borders, veils, fine network (Reticella), Points, and Bone lace, all of which are mentioned in the pattern-books of the time. The notorious Lucrezia Borgia, married for her third husband Alfonso d’Este, brother of Beatrice d’Este, connections of the Sforza family, the division of whose property has been spoken of just above. The marriage ceremonies were most lavish and prolonged, both at Rome and at Ferrara, the home of the bridegroom. The bride’s dowry consisted of 300,000 ducats, 100,000 in gold being paid down in Ferrara, and 200,000 being spent in clothes, plate, jewels, and fine linen, costly hangings, and trappings for horses and mules. Among the garments are mentioned 200 camoras, each of which was worth 100 ducats, with sleeves and gold fringes valued at 30 ducats apiece. The records of the d’Este family give full accounts of the clothes worn not only by the bride and her ladies, but of the bridegroom, his family, and the attendants. Amidst all this gorgeousness of damask, velvet, satin, brocade, and cloths of silver and gold, only one mention of lace is made. While it is true that records still in existence show that lace was made and used before 1500, it was by no means such an ornament to costume as it became half a century later. When Catharine de Medici came as a bride to France in 1533, the lace she brought with her was Reticetta and Punto Gotico. Her ruff, which was at first a modest affair, succeeded the chemisette of drawn-work which was used by Italian ladies at an earlier period. Mary Stuart wore these pearls at Amboise when she was the newly made wife of Francis II. Her hair fell upon her shoulders in rich curls, and she had a stiff ruff of lace about her throat. Nor were the ladies the only ones who changed the fashions of their garments radically and often. The splendid gorget ruffs of Punto Gotico were succeeded by the square collar bands and edgings, or by the collar wholly composed of the costly Gros Point de Venise. The portrait of Francis Carignan, Prince of Savoy, painted in 1634, shows the Van Dyck Point in the height of its beauty and in the richest Venetian Point. Points were succeeded by lace with a straight edge, which was made in the most beautiful patterns of flowered laces (punto tagliato a fogliami) about 1664, both in Italy and France. The fashion for wearing it was straight about the corsage, which displayed its beauty to the best possible advantage, and also threw into relief the lovely shoulders it encircled. Punto tirato, drawn-work combined with cut-work. Punto a Reticella, Greek lace, or drawn-work afterward worked with a needle in bands or points. Punto in aria, “points in air,” having no foundation of either cut- or drawn-work. Punto tagliato a fogliami, flowered lace, known variously as Venice Point, Gh-os Point de Venise, Rose Point or raised Point, made in silk, white or coloured, or flax thread. Punto Gotico is reticella or Greek lace of the earliest style, when the patterns were copied from the Gothic architecture then in vogue. Punto Burano is the lace made on the Island of Burano, not far from Venice. Much of this beautiful fabric was made there during the eighteenth century, and this particular variety has a reseau or network ground, not the brides or bar ground. This network was made entirely with the needle. From this fact the lace is not unlike both Brussels and Alençon lace, which have similar grounds. The old lace was extremely beautiful, and was made with the finest thread. The making of this lace was revived in 1872, and the Royal Lace Schools are situated on the island. Only the choicest laces are made there now, but they are no longer exclusively Italian in character, since beside the Venetian Point, flowered laces, and Venetian Rose Point, Brussels, Alençon, and Point d’Angleterre are copied there with the greatest skill. Point lace. 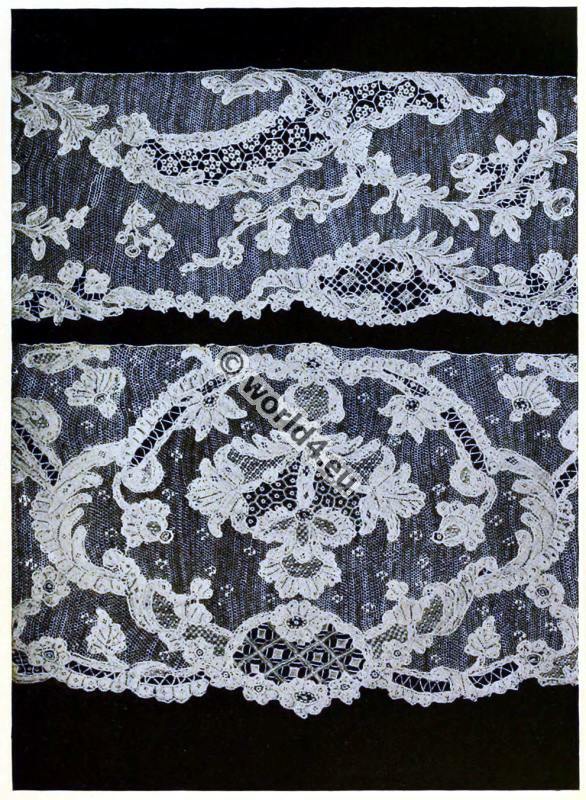 In Venetian laces, as in those of every other country, the term “point lace” grew to mean that the lace was of the finest quality, and made with a needle and thread. Connoisseurs, however, now use the term “point” to indicate lace of a superior quality and exquisite design, whether needle or bobbin, so that the Venetian bobbin lace, Brussels lace, and Valenciennes are called “points,” as much as the needle-made laces. The Venetian Rose Point, with its varied outlines, the most beautiful of all laces, had the ground of brides or bars. These brides were buttonholed over threads, and were the earliest form of a groundwork. From being at first irregularly placed in the work, and used only as supports, they became placed in regular shapes, almost forming a mesh. This form was followed by a regular mesh, six-sided, the bars were constantly made lighter and lighter, till at last the buttonholing was entirely given up, and the mesh was made of single threads. The Venetian Point à Réseau was the final outcome of this desire for the fine and light, and this form of lace was what the French workers seized upon and constantly improved. But the fine and very light laces demanded by fashion in the eighteenth century could be better made with bobbins, so the making of needle point declined. At the present time, when rich lace of the old makes is so eagerly sought, little ever comes to public sale, as there are always private buyers ready to take it. The old Venice Point, the handsomest lace in the world for wear on rich stuffs, and velvets in particular, always brings high prices. Some was recently sold at Christie’s, in London, for very large sums. A flounce 4 yards in length and 11 inches deep brought £350 ($1750). But as this lace could be used, one does not regard the price as so excessive as £24 ($120) for a square of Rose Point measuring but 25 inches, and of use only as a cabinet specimen. The first-mentioned piece, the flounce, was interesting from the fact that the pattern showed not only fine arabesque curves, but figures ; animals and birds were introduced as well, placing its manufacture in the sixteenth century. Still another length of Rose Point, 4½ inches wide and 5 yards and 21 inches long fetched the large sum of £15 ($75) a yard. Some panels for dress fronts were sold at the same time, the design conforming to the shape of the panel, some only 4 inches wide by 20 inches long bringing as much as £19 ($95), while one 20 inches wide and 43 inches long brought £38 ($190). Some splendid fichus of Rose Point and Gros Point brought from £38 ($190) to £150 ($750), and a small cap-crown had many bidders and was finally knocked down for £4 10s. ($22.50). These prices seem exceedingly high, yet it must be remembered that these Venetian Points are so solidly and beautifully made that they do not wear out or tear like the more fragile French laces, or like the Venetian Points à Réseau. Even after the severe sumptuary laws of Italy forbade the making and wearing of gold and silver lace, threads of these metals were woven or embroidered into flax tread laces for their further enrichment. The collection of laces belonging to Sir William Drake, and mentioned elsewhere, was exceedingly rich in specimens of thread lace enriched with gold. There was one piece which was considered quite unique, being 4 yards long and 29 inches wide. The pattern was of foliage in arabesques, introducing animals and buds, and at regular intervals were panels or medallions consisting of views and figures. In the length of four yards there were five of these: first, a queen with an attendant in a garden; second, St. John appearing as a monk; third, a monk telling his vision to six persons, all seated; fourth, people in a garden with a dove hovering in air; fifth, a king with armed soldiers and pages bringing gifts to the queen s surrounded by her maids of honour. The price given for this was £380 ($1900). There was another flounce also, and a pair of cuffs of similar pattern, both enriched with gold; they brought £135 ($675). Two pieces of cut-work on linen were also embellished with the finest gold wire, showing how the elegance and richness of the Renaissance would crop out, even in forbidden places. Only twenty-five lots of Sir William’s collection were offered at this particular sale, and of these, eighteen were of the fine old Italian laces, showing that the judgment of this distinguished connoisseur agreed with the opinion of those who have long believed that Venice led the world in lace as well as in the creation of other sumptuous works of art. Milan Point was lace made at Milan during the seventeenth century and earlier. It was made both of silver and gold thread and of silk, and the patterns became justly famous. Like the other famous Italian laces, Milan Point declined, and although lace is made there to-day it is of a coarse quality and very similar to the Torchon laces. Lavoro a Maglia, or Lacis, network on which the pattern is run or darned into the stuff. Punto a Groppo, or knotted lace, includes all the laces made of knotted cords, whether of silk, gold or silver thread, or coarse white or cream thread. It somewhat resembles the Guipures made in different countries as well as in Italy, and was used for ecclesiastical linen, and, by the upper-class Italians, for the trimming of bed and table linen. The chief characteristic of this lace is the variety of knots used in its making, which were tied with the fingers, individual workers sometimes having knots and combinations of their own which were very beautiful. The method of manufacture is on a pillow, the threads being cut into short lengths, so that they can be easily handled and knotted. At the present time, since gold and silver laces are no longer made, this lace is formed of thread, and has become a peasant lace, used by the contadini to ornament their undergarments. Guipure was a kind of lace formed of gold and silver threads. Owing to the nature of the material used, the designs were large and florid, requiring no brides or bars, and with coarse grounds. From this circumstance all laces with large designs and coarse grounds are called Guipure, although that name is now chiefly applied to lace made of black silk. Nor was the name applied only to the gold and silver lace mentioned, for it was also given to a style of trimming which is now known as passementerie, made of cords around which silk is lightly wound to conceal them. Formerly, instead of the cotton threads, a strip of parchment or vellum was used, called cartisane. The nature of this filling made the lace very perishable and costly. It broke, was ruined with water, and shrank with heat. It was used, even when made with silk, only by royalty and the very wealthy. Later the cartisane was discarded, and the Guipure became more common. In addition to these rich Guipures just described, thread laces made either with bobbins or needles, and with the patterns outlined in narrow hand-made tapes, were used as early as the time of Louis XIV. The Italian and Flanders varieties were the handsomest and most showy of these laces, with a background or réseau of round meshes, or simply brides. The fillings of the pattern were worked in a variety of stitches with a needle. By the first quarter of the seventeenth century the demand for lace was so great that these Guipures with tape design became very popular. The tape lace made in Flanders had peculiarities of its own, being of superfine quality and fineness. The change of fashion to the collar and falling bands required a heavier style of lace than the exquisite points of fairy lightness that had been used on the standing ruffs, and Guipures were found to be very suitable. Of course these laces were found on altar cloths as well as on secular garments; and the earlier ones had a straight edge, while the later ones had a clover-leaf edge, which made it a little heavier. These tape Guipures are still made in Italy, of handsome design, but lacking the charming irregularity of the old patterns and hand-made tapes. Genoa Lace. The rich old citv of Genoa was famous for its lace as well as for its gold work and jewellery. Perhaps it was on account of the number of goldsmiths that Genoa was among the first countries to make a sumptuous trimming made of slender wires of both silver and gold. They made this lace-like material in small quantities late in the fourteenth century. So popular was it that Venice followed suit and made it also; but it was not until several hundred years later that Genoese Points became well known and in demand all over Europe. 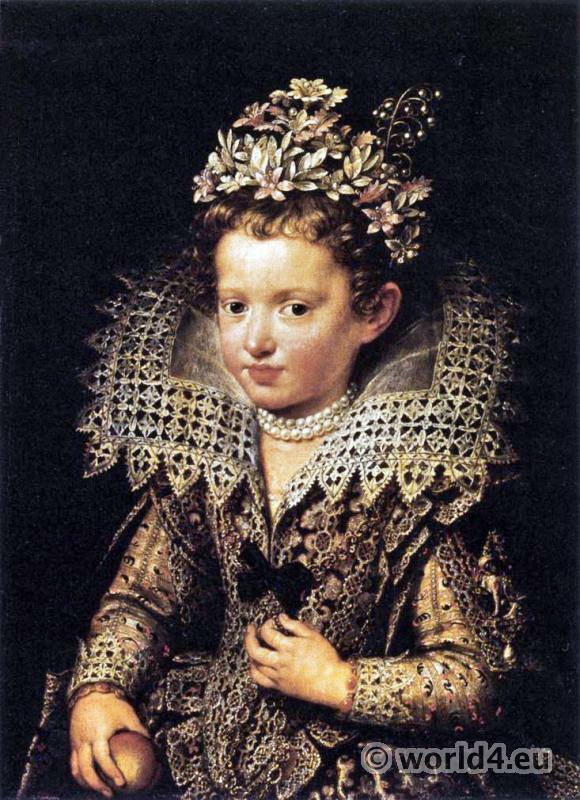 Few of the inventories of royalty fail to mention Point de Gênes, and Marie de Medici had much of it; but these laces were of silk or thread, since the Genoese Republic had made sumptuary laws regulating the wearing of gold and silver lace, as did the other Italian cities. While Venice held the palm for needle-point laces, Genoa was unrivalled for her bobbin lace, although she made needle point also. But the exquisite pillow-made fichus, collars, kerchiefs, and even aprons were universally sought, and more in demand than edging lace. Pieces like this necessitated the use of very large pillows, and each pillow required four workers to attend to the 700 or 800 bobbins used. The lace now made in Genoa is a sort of Guipure, and is sold in France. Carnival or Bride Lace, as it was called, was made in Italy chiefly during the sixteenth century. Like much of the lace of that period it was Reticella, made over drawn threads, but its characteristic was that the initial or monogram of the family or person for whom it was the personal linen of brides, it was worn at the wedding, or at festival or carnival times. Argentella Point closely resembles the French laces, Alençon or Argentan, and was made when the heavier raised laces were less popular. It has one great point of difference from the French laces in that the figures are not outlined with a raised cord or thread, but simply have a flat buttonholing. The designs are sprays, small ovals, or circles, and it was much esteemed on account of its delicacy and whiteness. The groundwork is a fine net. Punto de Ragusa. Ragusa, a city near the northwestern coast of Greece, was one of the greatest Adriatic ports of Greece during the fifteenth and part of the sixteenth centuries. The peasants of the near-by Ionian Islands, and of the villages along the coast of Greece, sent to Venice, through Ragusa, drawn- and cut-work in which they excelled. But these were not the so-called Ragusa laces, which were made of gimps of gold and silver thread fastened together by bars, and wrought on the edge into a pattern of loops and trefoils. While Venice soon excelled in thread laces, the gold laces of Ragusa were deservedly famous till late in the seventeenth century, but were finally driven from the field on account of the expense of the material, the prohibitions against them, and the beauty of the designs and workmanship of the flax thread laces. Aloe Lace, a fabric curiously delicate in character, considering the material of which it is made, has been woven in Italy since remote times. The pith of the aloe-tree is split into threads, and woven, tatted, knit, or twisted with bobbins into a sort of lace. Sometimes large pieces like shawls, lappets, and table scarfs are made; but the lace is of little use, since washing practically destroys it. It is made not only in Italy, but in the Philippine Islands, South America, and the Barbados Islands. It is always more interesting than beautiful and is seldom used. The superb Medici collars, which are familiar to us from the portraits of the period, were not complete without the framework of fine metal wires which supported them. In Italy these were called verghetti, and such large quantities were required that many people were employed in their construction. These workers, and others of like trades, gathered in one particular quarter of Venice, which was called after them, and it still bears the name. Source: THE LACE BOOK by N. Hudson Moore. NEW YORK FREDERICK A. STOKES COMPANY PUBLISHERS. 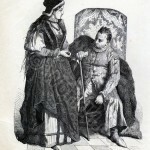 Poland Lady and Nobleman in the 16th century. German knights in full armor. Heavy cavalry. Knight of the Order of The Elephant 16th century. 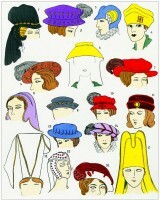 Renaissance hat fashion. Les Modes de la Renaissance. The Corset and the Crinoline. Fashion history. From ancient until 19th c.
Mary Queen of Scots England history.